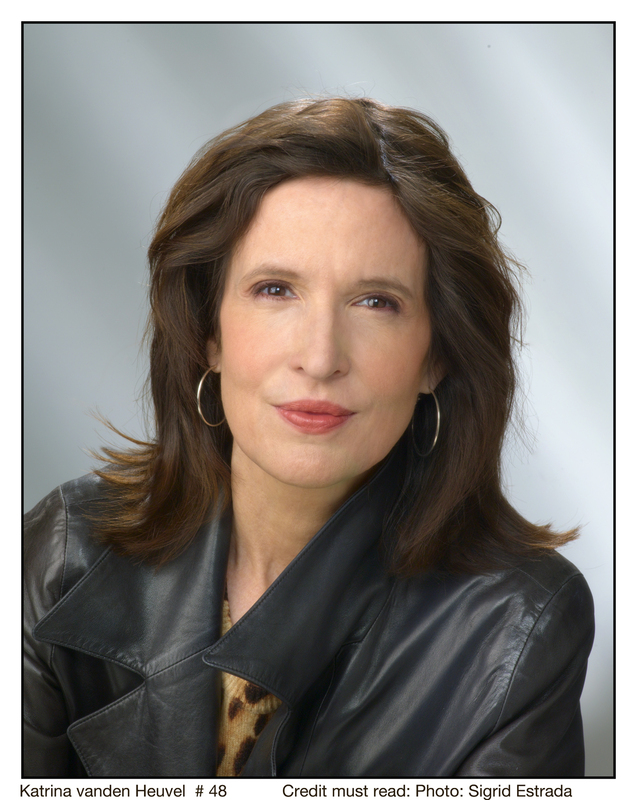 If you watch TV, read the news, or follow politics, you’ve seen or read or heard Katrina vanden Heuvel, a true icon for the progressive movement and media. Vanden Heuvel is the editor and publisher of The Nation, the oldest continuously published weekly magazine in the United States, founded in 1865. Vanden Heuvel’s blog “Editor’s Cut,” appears at thenation.com and she writes a weekly online column for The Washington Post. She is a frequent commentator on American and international politics on ABC, MSNBC, CNN and PBS. Her articles have appeared in The Los Angeles Times, The New York Times, Foreign Policymagazine and The Boston Globe. Vanden Heuvel is a member of The Council on Foreign Relations, and serves on the board of The Institute for Women’s Policy Research, The Institute for Policy Studies, The World Policy Institute, The Correctional Association of New York, The Women’s Media Center and The Franklin and Eleanor Roosevelt Institute. She received Planned Parenthood’s Maggie Award for her article, Right-to-Lifers Hit Russia, the New York Civil Liberties Union’s Callaway Prize for the Defense of the Right of Privacy, The American- Arab Anti-Discrimination Committee’s 2003 “Voices of Peace” award, and the Asian American Legal Defense and Education Fund’s 2006 “Justice in Action” award. Vanden Heuvel is the author of several books including Taking Back America – And Taking Down the Radical Right, Dictionary of Republicanisms: The Indispensable Guide to What They Really Mean When They Say What They Think You Want to Hear (2005) and The Change I Believe In: Fighting for Progress in the Age of Obama. And now, without further ado, the Feministing Five with Katrina vanden Heuvel. Katie Halper: What recent news story made you want to scream? Katrina vanden Heuvel: It made me scream to see that even while austerity’s theoretical underpinnings have been exposed as flimflam, constructed out of spreadsheet error and goofy logic, austerity’s reign of misery continues– just the other day, unemployment in Greece soared to 60%, 20 million in our country remain unemployed or underemployed, our growth is imperiled, yet Wall Street, which blew up our economy, grows more concentrated and powerful. Could we break up the big banks, build coops and community banks and move from shareholder to stakeholder capitalism that prizes the three “p”s….planet, people and profitability? KH: What, in your opinion, is the greatest challenge facing feminism today? KV: How do we ensure women control their own bodies — and thereby their own destiny. In the US and globally, if women control their own bodies, fates and future — whether it’s through access to birth control, education or economic independence, and by living in peaceful cultures, free of militarism and military occupation, all people are lifted up and it will be a healthier, more secure and just country and world. I think that we should pay a lot of attention to the rollback of reproductive rights, of women’s health. My good friend Ilyse Hogue, Nation blogger, now head of NARAL, has called it, “death by a thousand cuts” –of women’s rights to control their own bodies, which is so central to a democratic society.